The holiday rush can be a pretty hectic time. So what do you do if you want to bring a decorated cake to a Christmas party? Well, I've got the solution! 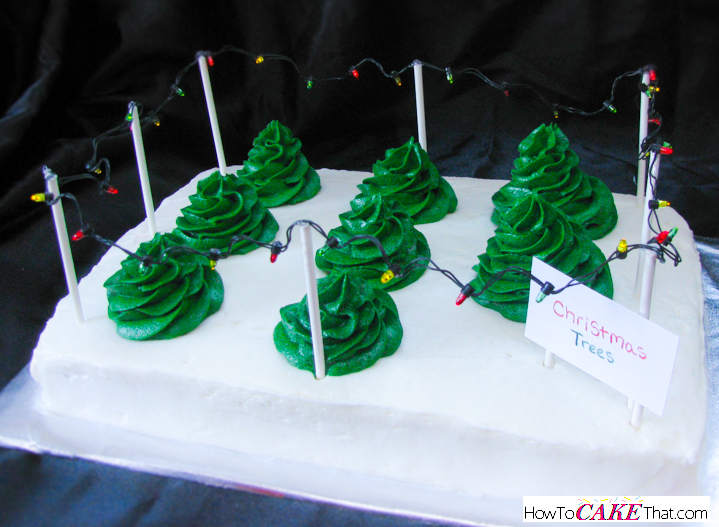 A super quick and easy, yet so adorable Christmas Tree Lot cake! Minus the baking and frosting making time, this cake took less than 45 minutes to assemble and decorate! It's perfect for when you want to bring a cute custom cake to surprise your friends and family, but just don't have much time! Check out how easy it is to make this super cute cake in the tutorial below! 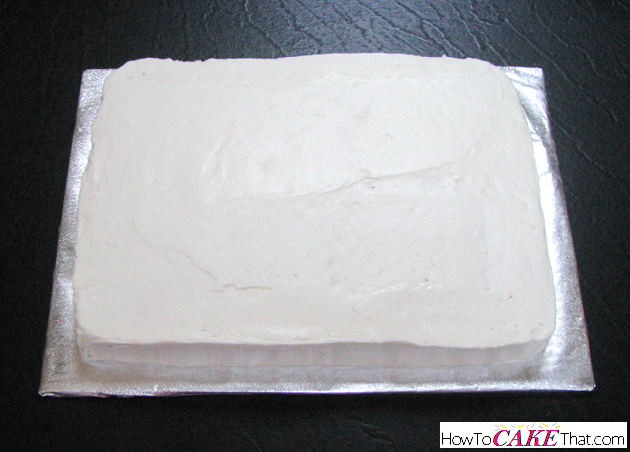 To begin this tutorial, I have baked a 13" by 9" cake and have frosted the cake with white American buttercream. You will want your frosting as clean and crumb-free as possible, so be sure to crumb coat your cake and refrigerate it to allow the frosting to set and get hard before adding the final coat of frosting. 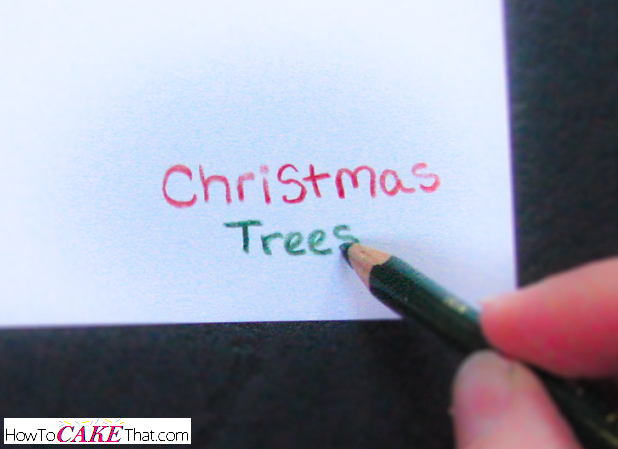 Next, using a knife or toothpick, mark where you would like your Christmas trees to sit. For my tree lot, I will be placing two rows of three trees and one row of two. The row of two will leave enough room to add our Christmas tree sign. Now it's time to make our trees! 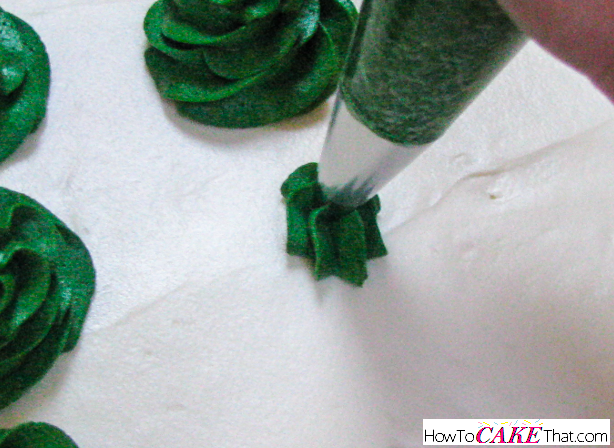 Color some of the buttercream with green gel food coloring. I used a lot of Wilton gel in Kelly Green, with a touch of Wilton Moss Green... to give it a more natural color. 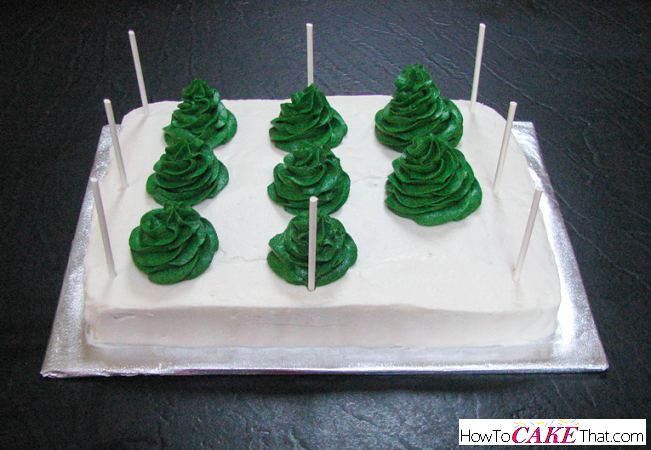 To pipe the trees onto your cake, place a Wilton 1M frosting tip inside of the piping bag. 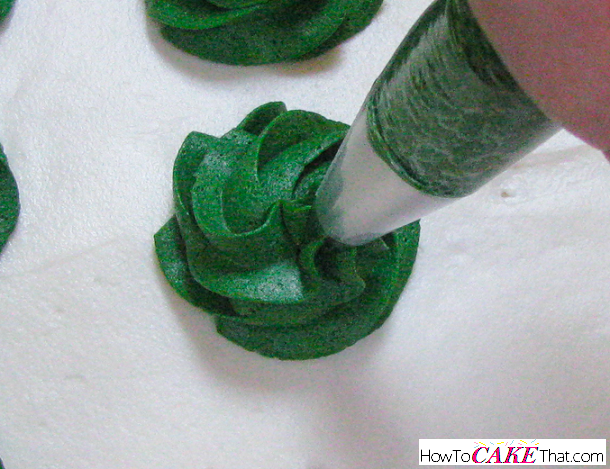 Fill piping bag with green buttercream. 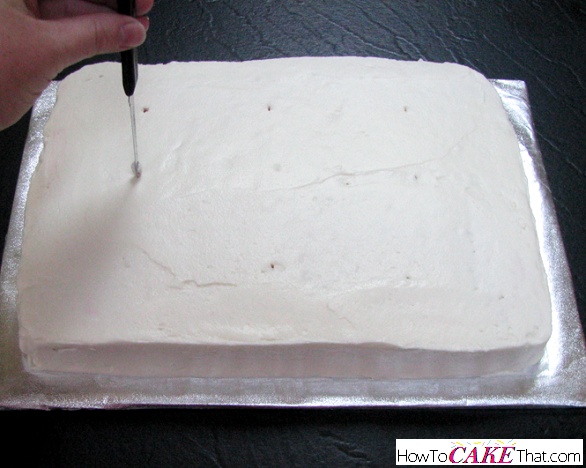 Begin by lining up the frosting tip with the mark made on the cake. Pipe a short line up in the direction away from where you are standing. 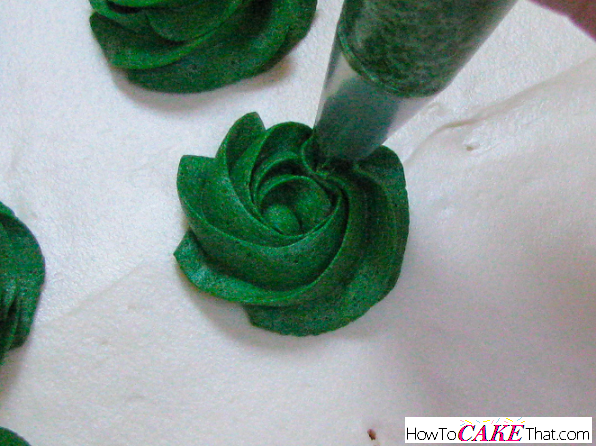 Continue piping and swirl around that line like you are creating a rosette. Continue the swirl, layering on top of the first swirl. Be sure to make your swirls smaller and smaller for each layer to create the tree's cone shape. 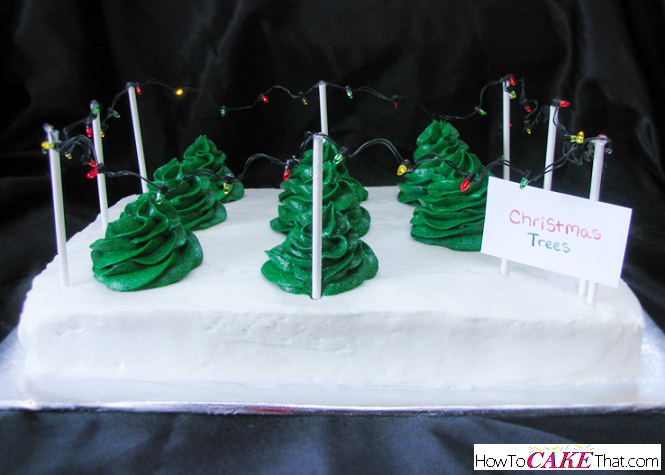 Once the tree has reached the desired height, release pressure from piping bag and lift up and away from the tree. Now it's time to add the poles that will hold our Christmas lights! 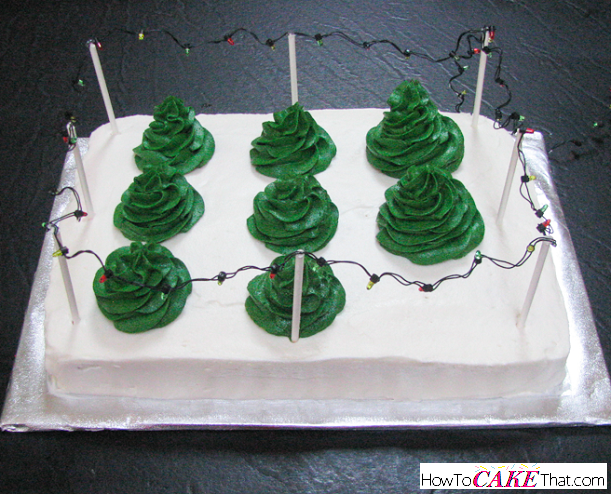 Use cake pop sticks or bamboo skewers and trim to an appropriate height for your cake. Be sure to trim the sticks so they are all the same height. Insert sticks into the cake where light support is needed. For this tutorial, I am using a string of lights that really lights up - it's the Lemax 50 count multi color light string for the little snow villages. If you wish to not use a light-up string, a string of non-lighting mini tree decorative lights can be used! 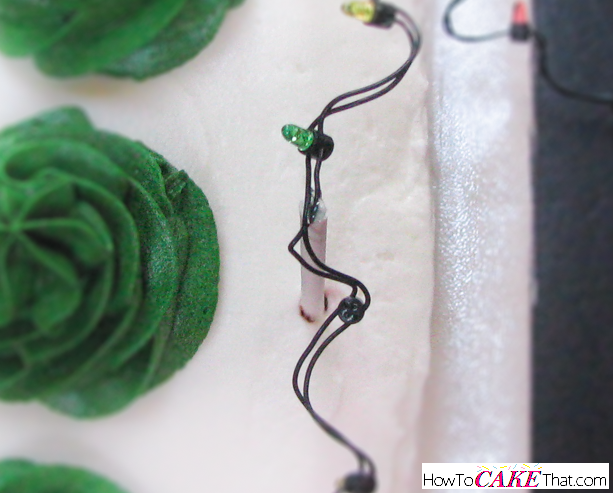 Beginning at the back of the cake, attach the lights to the sticks by dotting a little hot glue onto the string and pressing the glued spot to the top of the stick. Be sure to line up and measure where you'd like the string to attach to the stick before gluing. I like to put the hot glue directly onto the wire and then moving the wire to the top of the stick. 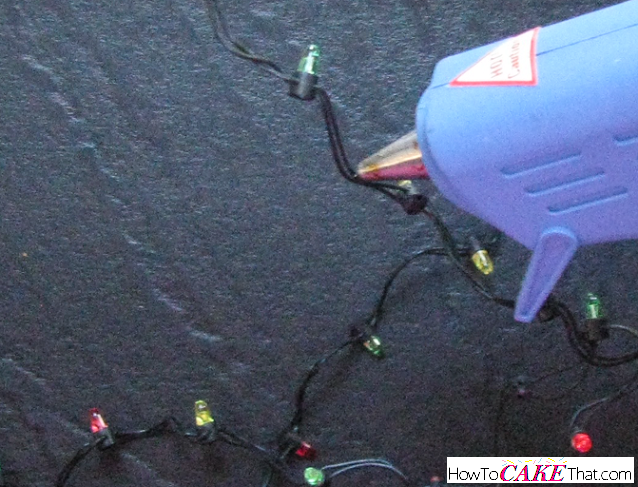 Sometimes hot glue likes to create little stringy pieces and to keep them from getting onto your frosting, it's best to glue away from the cake. Oooh.... it's looking so pretty! Now we need to make our little sign. I'm writing on a piece of sturdy cardstock paper with colored pencils. For a neater appearance, type and print out your sign. 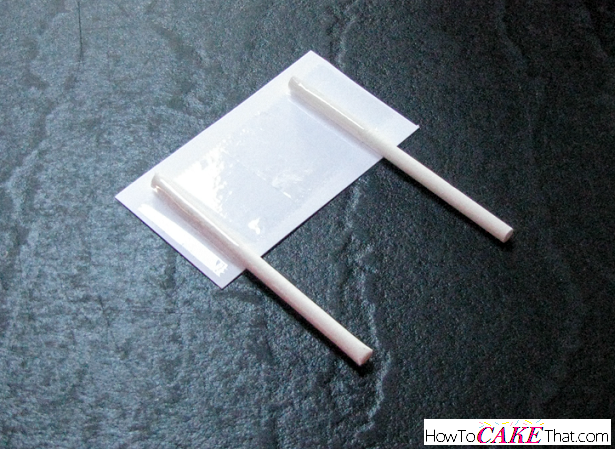 Cut out your sign and cut two poles using cake pop sticks or bamboo skewers and tape to the back of your sign. Place the sign at the entrance to your Christmas tree lot. 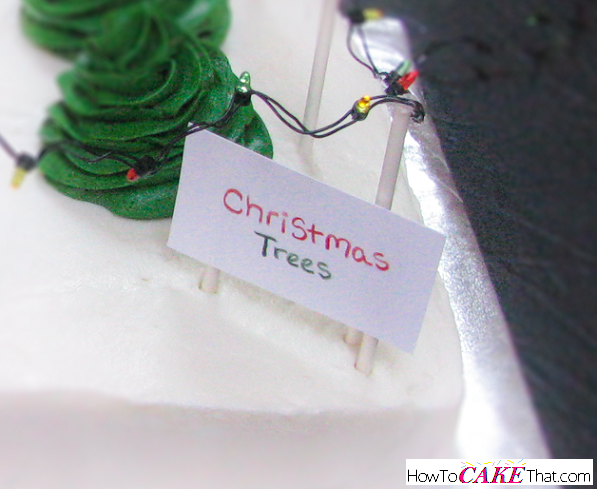 And that's how you make this quick and easy Christmas tree cake that is sure to Wow your friends and family! I hope you have enjoyed this tutorial! Merry Christmas and God bless!